Holiday Cottages in Eastern England. 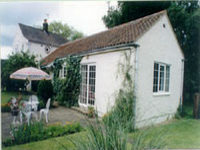 View details for Clinton Cottage Sleeps 2-4 in Yaxham, Norfolk. Provided by Holidaycottages.cc. A pretty detached single storey holiday cottage, with its own secure and private garden, set in peaceful countryside overlooking open fields. Clinton Cottage sleeps 2/4 +cot. The cottage is cosy and tastefully furnished and has double glazing and is well insulated. This very popular and self-contained cottage is very well equipped to a high standard. Attractive bedroom with double bed, duvet, electric blanket and clock/radio alarm. Water is heated by an electric immersion heater. Electric wall mounted heaters in all rooms. Electricity by £1 coin meter. Pets permitted by arrangement free of charge. Bed linen, towels and tea towels provided free of charge.